This was one of our all time favorite weddings to be a part of, mostly because we absolutely adored this sweet and down-to-earth couple, but also because the preserve offered such an inspiring location and we had fantastic team of vendors to work alongside all day. It really was a perfect day and I’m so happy to see it published on The Carats & Cake! Check out the full feature and the full list of vendors here. 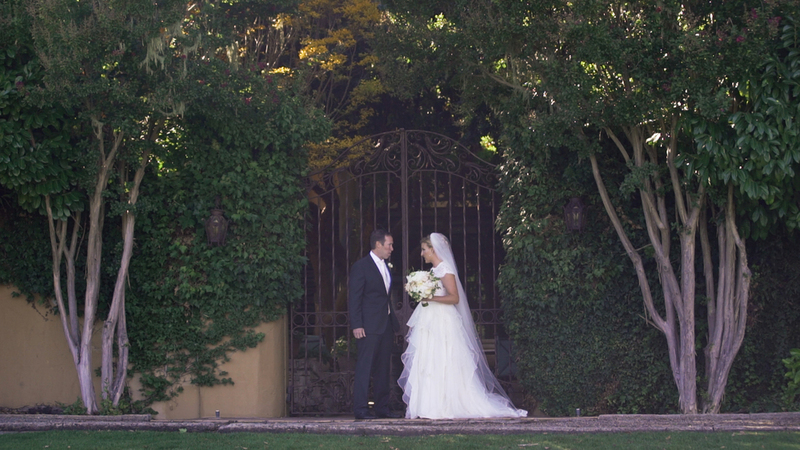 This was our first time filming at the Santa Lucia Preserve and we could not have had a better couple or a better wedding to introduce us to this huge venue. Every aspect of Natascha and Kevin's wedding was filled with elegance, romance and simple natural beauty. The grounds are surrounded by golden rolling hills dappled with oak trees, and tucked away on the property there's even a redwood grove! Not to mention the beautiful hacienda, and charming rustic barn. One of Natascha's friends took the words right out of my mouth when she said to me, "When the doors to the barn opened, I was blown away. It looked like something straight out of a magazine!" The day was filled with beautiful details and breathtaking moments. The combination of location and decor was the perfect complement to who Natascha and Kevin are as a couple. Many of the details (like Natascha's stunning gown) reflected her wonderful sense of style, while the setting reflected Kevin's love of the outdoors. The day was lovely in every way and we are so happy we could take part in capturing it. Working alongside Lindsey and Nathan from Bellalu Photography, Rebecca and Marisia from Rebecca Reategui Weddings and Special Events and Scott from DJ Cams made this gorgeous wedding a joy to capture. Natascha and Kevin couldn't have had a better group to bring their wedding together. You can find the rest of this dream team below. If, like me, you can't get enough of this stunning wedding be sure to check out Lindsey and Nathan's photos.